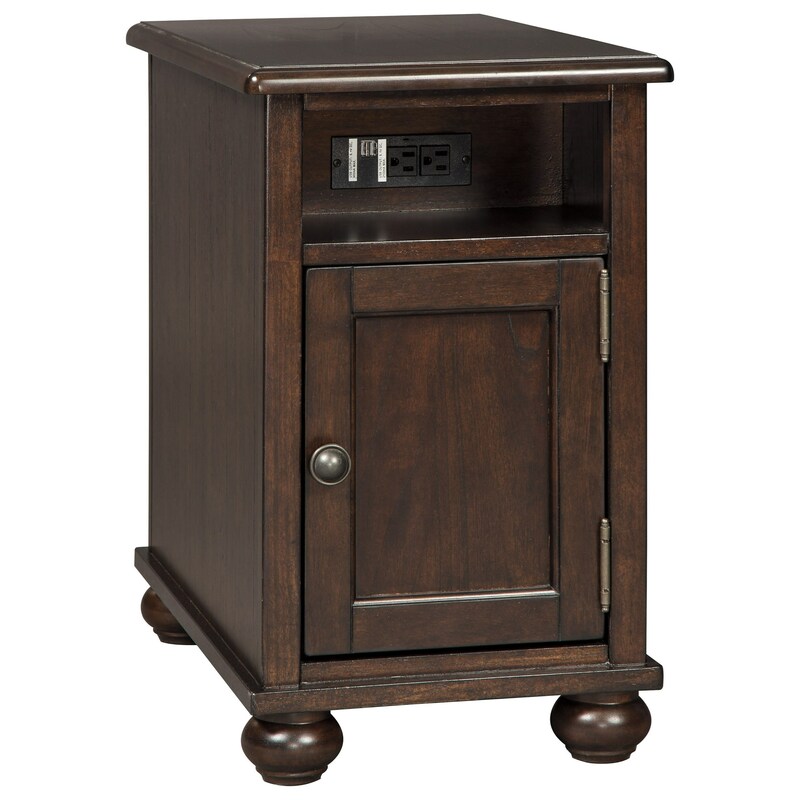 Classic style and modern function come together with this chair side end table. The shelf of the table has built-in power outlets and USB charging ports for your devices. Tuck away items within the concealed storage of the door at the base of the table. Made of mindi veneers and hardwood solids in a dark brown finish, the elegant bun feet and molding details elevate the table's design. The Barilanni Chair Side End Table with Power Outlets & USB Charging by Signature Design by Ashley at Sam Levitz Furniture in the Tucson, Oro Valley, Marana, Vail, and Green Valley, AZ area. Product availability may vary. Contact us for the most current availability on this product. Storage Door opening 8.75" x 21.00" x 12.75". Top opening 10.00" x 7.50" x 4.25". Cord length 86.00"
Incorporate timeless design into your living room decor with your choice of pieces available from this accent table collection. Bun feet, refined molding, and a dark brown finish over mindi veneers contribute to a classic look, while modern functionality is perfect for today's lifestyles. The Barilanni collection is a great option if you are looking for Transitional furniture in the Tucson, Oro Valley, Marana, Vail, and Green Valley, AZ area. Browse other items in the Barilanni collection from Sam Levitz Furniture in the Tucson, Oro Valley, Marana, Vail, and Green Valley, AZ area.